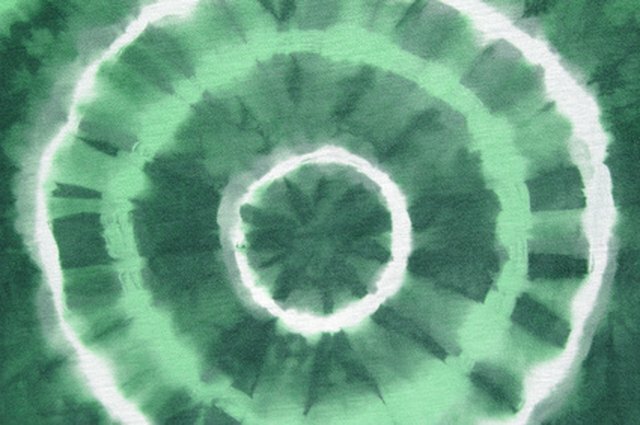 When thinking about tie-dye, people commonly think of white shirts, dyed bright and bold colors to form a pattern. However, black shirts can be tie-dyed using bleach. The bleach discolors the black fabric resulting in cream and brown patterns on the clothing. There are different patterns to choose from, such as spirals, bull&#039;s-eye, stripes and pleats. 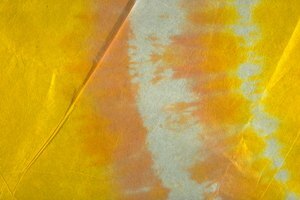 When selecting an article of clothing to dye, pick an article made of at least 50 percent natural fibers, such as cotton, linen and rayon. Decide on the pattern. Use the Resources section for folding the clothing to produce a pattern. Use rubber bands to hold your pattern in place. Wet the shirt, if desired. The drier the shirt, the more bleach it will absorb, and the more color it will lose, resulting in a cream or light brown color. If the shirt is wet, it will absorb less of the bleach, and the bleaching will result in a darker brown color. Wet the shirt all over, or in certain parts, or not at all depending on the desired effect. Wring out wet spots to remove excess moisture. Put on rubber gloves and protective eye goggles to protect yourself from the bleach. Fill a sink or a bucket with warm water. Add anywhere from 1 qt. to 1/2 gallon of bleach per 5 gallons of water. The less bleach you add, the darker your shirt will be, the more bleach you add, the lighter the shirt will be. The amount of bleach to add varies based on the desired effect. Submerge the shirt in the bleaching solution. Leave the shirt in the solution for five to 10 minutes. Use your eyes to tell you when to remove the shirt based on the coloring of the fabric. Keep in mind that wet fabric is slightly darker than dry fabric. Never leave fabric in the bleach solution for longer than 10 minutes or the bleach may eat away at the fabric. Cut away all of the rubber bands from the shirt. Place the shirt in the washing machine. Wash and dry according to the fabric care directions. You can wash the shirt with other bleach-dyed black clothing, but do not wash it with anything else. After the shirt has been laundered once after bleaching, it is safe to wash with other colored clothing.